The mastery of this children’s book is the way everything is woven artfully into one exquisite whole, even while each part, each character, stands out clearly. Trying to extract even one ‘soundbite’ from the web of words and thoughts in Wintersmith is almost a sacrilege. I must admit I am in awe of the talent that Terry Pratchett brings to a children’s book, more properly called children’s literature. It is definitely literature. 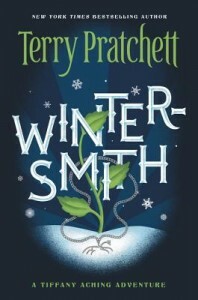 This is another children’s book in the series that Pratchett wrote about Tiffany Aching, a young witch in training, a sequel to The Wee Free Men. While the idea of a witch in training could sound lightweight, Pratchett’s writing is just the opposite. Beautifully thought-out observations about human nature flow throughout the book, particularly in light of the fact that the main job of witches is not magic, but healing people through common sense. It’s very tempting to read this children’s book quickly, to get to the action and resolution, which I did. At the same time, there is such a play between laughter and deep philosophy, that it warrants reading a second time, to really savor the terrific craftsmanship in the writing. Things never get too serious or too giddy. The appearance of the Wee Free Men throughout adds comic relief to the entire story. And even uncommon events, such as sitting up with someone who is dying, turn into lessons in patience and compassion. I wondered to myself as I read the book, what age would best appreciate this children’s book. In some ways, this is a coming of age book, as our young Tiffany turns 13, and encounters the idea of ‘romance.’ There is also much that one could miss if it is read by someone without the intellect to grasp the puns, and the deeper points. At the same time, the story is a terrific fairytale, or myth, old as humanity, of the dance of Winter and Summer. The School Library review puts it at 6th grade and up (12), and I agree. I read the next in the series, I Shall Wear Midnight, and while it is a compelling story, the portrayal of the evil, soulless monster of hatred is a bit scary. While it ends well, it’s hard for me to recommend it to anyone younger than 16. However, as with Pratchett’s other books, I’m still eager to read others, knowing that they may or may not work.